Colors: Orange, lemon, gray, or black. other acceptable colors are bicolor, tricolor, or grizzling. 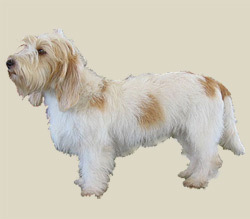 The Petit Basset Griffon Vendeen is a small, rustic dog with an unkempt, natural- looking, harsh, wiry coat, shaggy eyebrows, beard and mustache. The PBGV has a double coat. The inner coat is for warmth and is soft. The rough single coat protects the dog when hunting in thick underbrush. It comes in white with markings in any of the following colors: black, orange, yellow, tri-color and grizzle. The well-proportioned Petit is about 50% longer than tall. The tail tapers and is carried high and alert. Its eyes are large and dark, with an intelligent expression. It has muscular thighs and well-boned front legs. The thin, long, oval, hair-covered ears reach almost to the tip of the large-nostrilled nose. The back is level with a slight arch over the loin. Despite its appearance, the PBGV is not a basset hound in a wire coat, but in many ways is more terrier-like in temperament. It is a merry, inquisitive, tough, busy dog, always on the lookout for excitement and fun. It loves to sniff, explore, trail and dig ? a true hunter at heart. Amiable and playful, it is good with children, other dogs and pets, and it is friendly toward strangers. The PBGV is stubborn and independent. It tends to dig and bark. The PBGV is not content to lie around. Its exercise requirements can be easily fulfilled, however, by a good walk on leash or a vigorous romp in the yard. It can sleep outdoors in temperate climates, given adequate shelter, but it is happiest when dividing its time between house and yard. The coat needs weekly brushing and occasional tidying of straggling hairs.